Muwahhideen Publications is honoured to announce a LIVE tele-link lecture with Shaykh Fu'ad Ibn Sa'ud al-'Amri (May Allah Preserve Him), from the mashaayikh of Jeddah and a member of The Saudi Commission for Enjoining Good & Forbidding Vice. 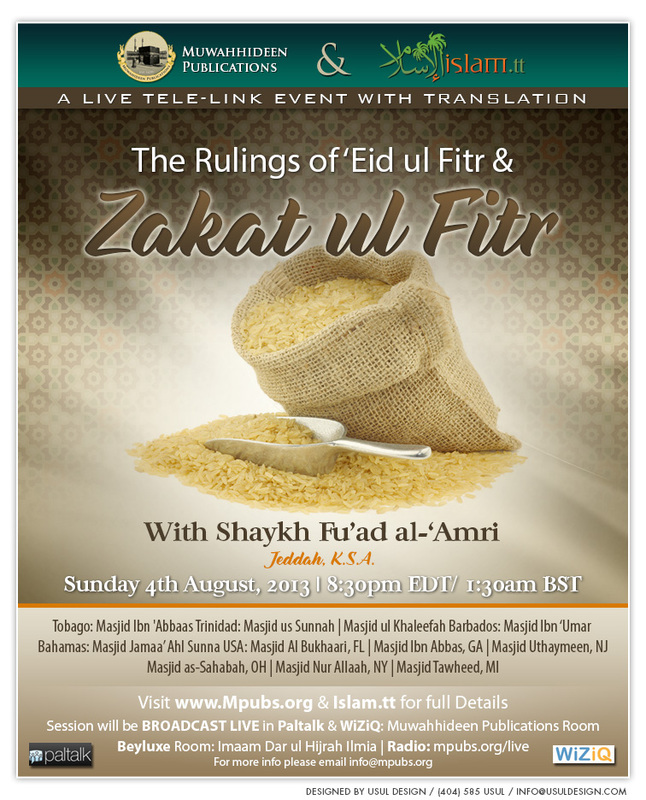 On Sunday 4th August 2013, the Shaykh will lecture to us surrounding the topic of the rulings of Ramadhaan and Zakat ul Fitr. This event will be broadcast LIVE in Masjid Ibn 'Abbaas, Tobago, two masaajid in Trinidad, Masjid ul Khaleefah and Masjid us Sunnah, and six masaajid in the U.S. Masjid Al-Bukhaari, Florida, Masjid Ibn 'Abbas, Georgia, Masjid Nur Allaah, New York, Masjid as-Sahabah, Ohio and Masjid Tawheed, Michigan.